I’m at the annual conference of AMPO, the Association of MPOs. For those of you not in the know, “MPO” stands for Metropolitan Planning Organization -- they’re the planning boards that really have some clout, since they prioritize transportation projects for funding within regions. 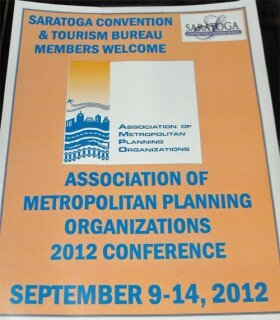 There are planners here from MPOs across the country -- from Texas, to Iowa, to Delaware. I sat in on a session focusing on some of the challenges in promoting transit. Panelists focused on projects in Tulsa, Oklahoma; Atlanta, Georgia; and the capital region of Washington State, including Olympia. 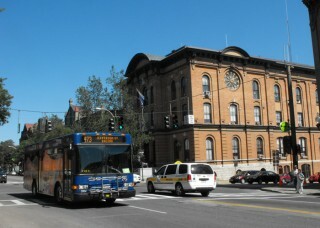 The small city of Saratoga Springs, New York, has a vibrant downtown -- and frequent bus service along Broadway, its "main street" corridor. City Hall is visible on the right. For more on Saratoga Springs, see PCJ Editor Senville's 2009 post noted in the sidebar. The session actually started precisely on time. As those of you who attend conferences know, that’s not the norm (at least at planning conferences I’ve attended). But panel moderator Rich Weaver of the American Public Transit Association explained: “Because transit is always on time, we’re going to start on time.” Hey, that even got a few laughs! The project Selin and her co-presenter Peter Haliburton (also with Cambridge Systematics) discussed is aimed at increasing coordination across these different transit agencies. One key element is implementation of a “transit data warehouse” linking all 13 service providers. It contains both operations and inventory data. As Haliburton explained, the inventorying of everyone’s existing physical assets has led to the identification of cost-saving opportunities. There are plans now for unified marketing; joint recruitment and training of transit personnel; joint procurement; and coordinated research. There’s also a public web site where anyone can view ridership and performance data -- plus an interactive transit map. 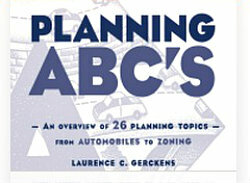 How are land use and transit linked? That was at the heart of a fascinating presentation by Thera Black, a Senior Planner with the Thurston Regional Planning Council in Olympia, Washington. Given the importance of this topic to planning commissioners in many parts of the country, I’ll be speaking more with Black in the coming weeks, and more fully reporting on the approach this regional planning council has taken. That’s right, decide what you want your land use patterns to be, and then work to develop a transit system that supports those policies. This, in turn, will help promote development where you most want it. Black referred to one pillar of the approach being taken in the region as providing “premier transit service” -- that is 15 minute or better frequencies; connectivity between routes; and having many walkable destinations close to major stops. The Task Force decided to give priority attention to an 11 mile corridor connecting the region’s three major cities, Olympia, Lacey, and Tumwater. Then within that corridor, identify potential “corridor districts” where efforts to spur development would focus. The aim is to encourage transit-oriented development. Local land use policies can also help promote transit use. One that Black cited is how communities deal with the parking standards in their zoning ordinances, saying that: "I can’t over-emphasize the importance of parking standards, and having parking maximums, not minimums." Coincidentally, that's one of the very messages I heard three years when I met with local planners right here in Saratoga Springs, New York. See "Downtown Housing -Minus Parking +Plus Commercial." 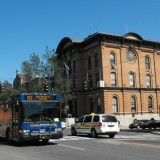 How many people do you think use a transit system where the average headway between buses on a route is 60 minutes? If you guessed, “not many,” you’d be right. (Even if you haven’t heard the terms “transit captives” or “choice riders” before, you can probably safely guess who they refer to). One of the challenges facing the Tulsa system is that it is dependent on annual city appropriations from the general fund -- making long-range planning difficult. One hopeful sign according to Brauer has been the growing number of people saying that “if we’re a great community, we need to have a great transit system.” Wagner and his co-presented Todd Brauer (Vice President and CFO of Whitehouse Group, Inc.) have been working on a project aimed at changing the transit dynamic in Tulsa. Hope to have more on that in a future post, as it’s in auto-dependent areas like Tulsa where the biggest challenges -- and biggest opportunities -- for transit lie. For a look at issues facing downtown Saratoga Springs, NY, see PCJ Editor Senville's 2009 report, Downtown Housing -Minus Parking +Plus Commercial.